S. Robert Allcorn is Of Counsel with the firm. He has 39 years of experience in complex commercial litigation, employment and matrimonial matters, and more than 30 years as a partner in the firm and is one of its founding members. As of counsel to the firm, he continues in his role as a consultant in the firm and maintains an active mediation practice. Mr. Allcorn also has taught litigation strategy at law schools, serving as an adjunct professor at Rutgers School of Law, Newark and Benjamin Cardozo School of Law in New York City. He has actively taught other attorneys in various capacities. For instance, he has been on the faculty of the National Institute of Trial Advocacy and Professional Education Systems, Inc. Mr. Allcorn has authored numerous articles on litigation issues, as well as the “Discovery” section of the New Jersey Practice series (Thomson Publishing Co.). Mr. Allcorn has been AV® Preeminent™ Peer Review Rated — the highest rating in legal ability and ethical standards — by Martindale-Hubbell® for more than 25 years. For a description of the selection methodology for Martindale-Hubbell, please click on the link. No aspect of this advertisement has been approved by the Supreme Court of New Jersey. Mr. Allcorn was appointed to the Supreme Court Civil Practice Committee, serving as chairman of the Discovery Committee, as well as on various subcommittees (Pro Hac Vice; Dispositive Motions; Discoverability of Experts’ Draft Reports) and is a member of various committees of the American Bar Association and the New Jersey Bar Association. He has maintained an active interest in the American Inns of Court Foundation, both nationally (co-chairman, National Development Committee; Nominating and Elections Committee; Awards Committee; secretary, Leadership Council), as well as in New Jersey (president, vice-president, master and lecturer, Arthur T. Vanderbilt Inn of Court; and master, Garibaldi Inn of Court). For the past eight years, Mr. Allcorn has concentrated his practice primarily in mediations. He is a professionally trained mediator and a Superior Court Approved General Mediator, Matrimonial Mediator and Foreclosure Mediator. Having successfully concluded hundreds of mediations, he has achieved the status of Accredited Professional Business Mediator which was bestowed on him by the New Jersey Association of Professional Mediators. He has been assigned by numerous judges and recommended by many attorneys to mediate complex cases and is approved as a mediator by the American Arbitration Association, where he has been a member of the New Jersey Commercial Advisory Council of that organization. He is also a member of the Association for Conflict Resolution. Mr. Allcorn also has been appointed by courts to serve as an arbitrator, fiscal agent and discovery master. He has also been included in N.J. Biz Magazine as one of “New Jersey’s Top Mediators” and Who’s Who in American Lawyers. Mr. Allcorn earned his J.D. at Rutgers School of Law, Newark, and his B.A. at Carleton College. Clients rely on Rabner Baumgart Ben-Asher & Nirenberg, P.C. 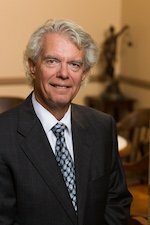 for the drive and perseverance its attorneys provide and the results they produce in employment discrimination, whistleblower retaliation, sexual harassment and other employment-related cases, as well as in its comprehensive representation of entrepreneurs and small businesses in corporate and commercial matters. From its welcoming office in Upper Montclair, the firm serves all of New Jersey and also represents clients employed in New York.